Goodness how quickly the winter months have gone by! It seems like a few hours ago that I returned to my “Costa del Sol” mountainside perch overlooking the Mediterranean Sea. In a few weeks I will be gone from the charming Mijas Pueblo. 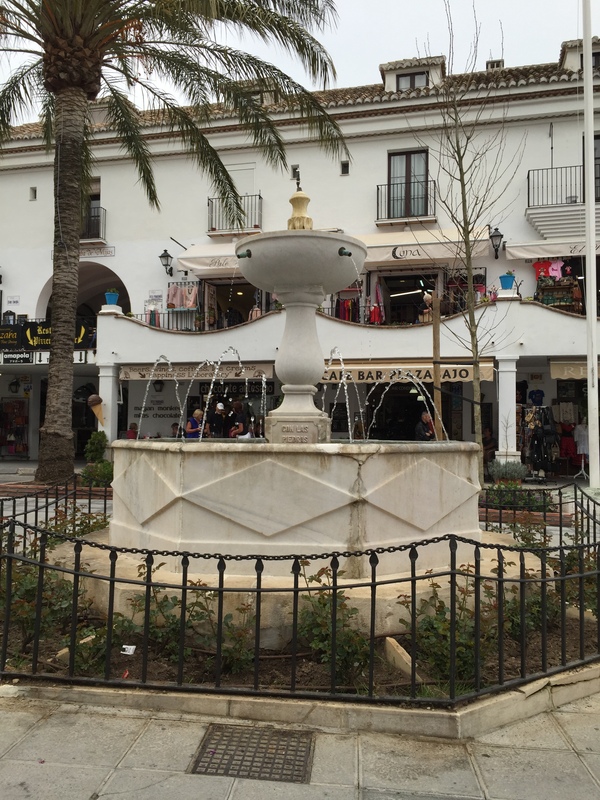 Over the two winters here I have become very aware that Mijas is a place that is tantalizing for the senses and that’s what this blog is about. I hope in reading this you will sense what I have and that Mijas Pueblo and the Costa del Sol will become new stops on your bucket list. Recently I had lunch in the USA with a colleague. He pointed out that I have shared images and words about many of my Spain journeys to Granada, Ronda, Cordoba, and the Canary Islands but had documented my Mijas experience only in a limited way. So with this blog I share the sensations of the village I call “home” from having “wintered” here for the past two years. Mijas Pueblo is located on Spain’s southern Mediterranean Sea coast and the nearest city is Malaga, Picasso’s birthplace. Gibraltar is located about 70 kilometers further down the coast. The village buildings are almost always white and the town is situated 450 meters above sea level on the side of a 1600 meter mountain. Remnants of ancient civilizations dating hundreds of years BC are evident along with artifacts from times when the area was dominated in succession by Romans, Visigoths and Moors. The village name is derived from the Roman name “Tamisa” which was shortened to “Mixa” and ultimately “Mijas.” Today, tourism is the principle economic resource of the community with thousands of people arriving everyday from every part of the world. In the oldest part of the pueblo stood a fortress and parish church that also served as a watchtower. Today, the church is still used but the original settlement area is now a park, the Parque La Muralla. Parque La Muralla is flooded with crisp mountain air and overlooks that provide spectacular panoramic views of Fuengirola and the Mediterranean coastline. On clear days the Rock of Gibraltar and the mountains in Morocco can be seen. Beautiful semi-tropical vegetation flourishes in the park and provides pleasant fragrances among the walkway paths and flowing water. Climbers often scale the rocks to the top where the park is located. I love this park as an excellent place to find stillness sitting on a rough rock seat and listen to the birds and running water. Even the tourists are mesmerized into silence by the stunning beauty and views found here. There are numerous visitor attractions in addition to the vistas, old white buildings, and roughness under one’s feet on cobblestone streets. 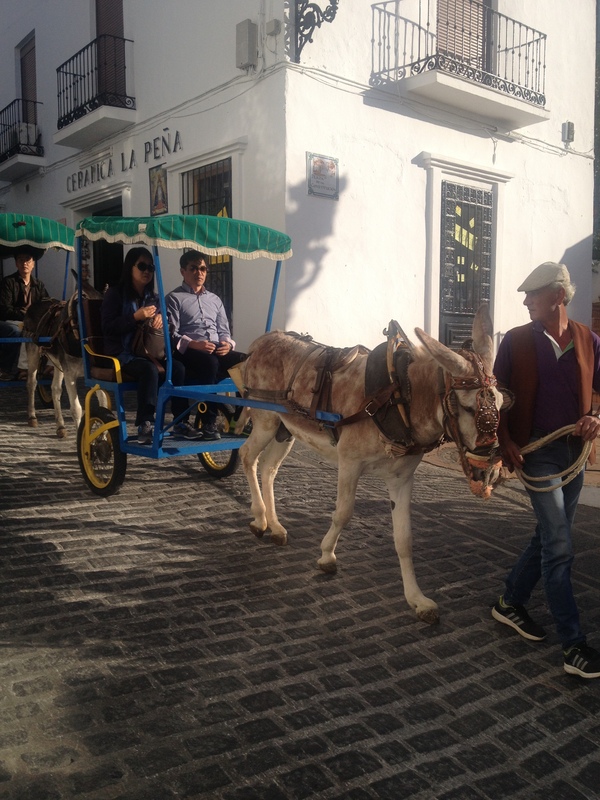 “Burro taxis” have been in existence ever since tourists began to arrive in the village. At one time the “taxis” were a means to get around but today they are an attraction. Many people hold their noses around the burros but I find the donkey smell brings authenticity to this old community. There are many other smells wafting through Mijas like fresh baked goods, street vendors roasting their almonds in a sweet sugar mixture, and delicious foods cooking at Gambas where the “menu” lunch on the hidden second floor terrace is only €7.25 including soup, bread, entree and wine! The wind often howls through this community, stiffening the flags, and swaying their poles. Walking with the wind at your back is so forceful it makes you feel like a human sail! And when it rains on the mountain, water gushes through the ravines toward the sea. I have been thoroughly soaked in the drenching downpours. As storms and wind approach, the villagers lock themselves inside and the town vendors scramble to bring their pottery and leather wares to indoor safety. Mijas is thought to be home to around 7500. This seems like a high number as it includes many from the UK who either live in Mijas or own holiday property here. As I leave the town for my next exploration, I will miss many people. Steve and Brenda run the shop called “Tickled Pink” and they have tolerated my consulting pontification. They are very friendly folks and when you come to Mijas be sure to stop in. Bruno operates “Bella Vista” and everyday makes my usual €3.70 breakfast called the “Andaluz” which is “pitufa con tomate, zumo de naranja, y cafe con leche.” It is a delicious natural treat found in this town. Fares Jaber at Clinica Mijas is the town doctor and has watched out for my well-being. He is my age and a new grandfather. He always stops me on the street to shake hands and to ask how I am doing. Joanne and David from “Mijas Rentals and Sales” have found places for me to stay in the village and have been great helpers even when I have locked myself out. I will miss Mijas’ sounds… the rooster crowing daily at sunrise, the donkeys and their incessant screaming hee-haws, the small brass band from which sounds crisply spring over the pueblo during Sunday bullfights, bells jingling on horses clomping along pulling carriages transporting visitors through the streets, bells tolling from the three barrio churches, the town hall quarter-hour chimes, the sensual Spanish acoustic guitar player at La Alcazaba lunch (with exceptional lasagna and tapas), the sultry screaming guitar with clapping castanets at flamenco dance exhibits, and the butane delivery people honking their truck horns as they drive through the narrow, one-way village streets yelling out “bu tan oh” from the driver’s window. I have enjoyed visiting “Mayan Monkey” for superb ice cream and hot chocolate made from real Belgian chocolate and I like dropping in on one of several bakeries for afternoon snacks and a tea or cafe latte. It has been nice living in Mijas, walking through the streets and being acknowledged by the villagers with warm greetings in Spanish which I return in Spanish too. I hope you enjoyed reading about my Mijas explorations and the impact on one’s senses. My next adventure on leaving Spain at the end of March will take me on a new exploration as I seek to learn more about Dracula and Vlad in Transylvania. I will travel to Budapest following my next trip from the USA and then journey by bus or train to Romania and the small city of Cluj-Napoca which will be my base through April. From there I will launch my next adventures and the new explorations with blogs to come about them. Return to Mijas Pueblo, España! 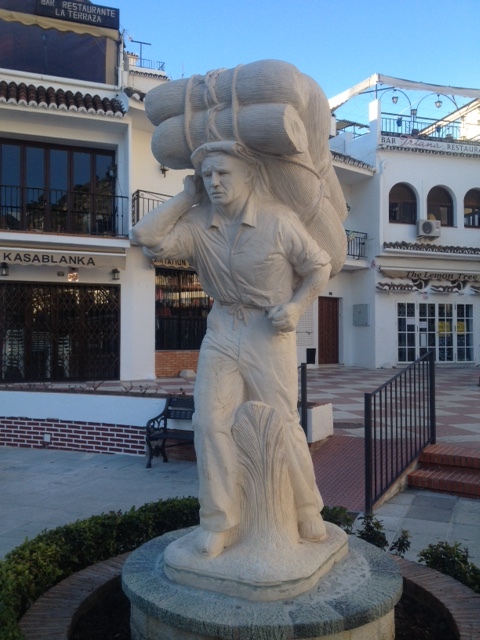 This week I returned to Mijas Pueblo, Spain on the Costa del Sol near the Mediterranean Sea. Last year I “wintered” in this small village that is perched on a mountainside overlooking the city of Fuengirola and the valley leading to the sea. When I left Mijas in March, I reflected that I felt like it was “home” to me. I established several relationships with people living in the Mijas community last winter and I felt that in many aspects I became interested in things that occupy the minds of the residents. If you follow my blog you also know that I had exceptional experiences over the spring and summer months in Austria. But I am happy to return to Mijas Pueblo and on the very first day found myself comfortably fitting in! After stopping by the rental office and retrieving a bag I had left there, I found myself reconnecting. I once again went to Bella Vista, my favorite small cafe on the Avenida de Mejico leading into the pueblo. Bruno works there and he recognized me, we greeted each other, and in Spanish asked if I wanted my usual… pitufa con tomate, zumo de narajna, y té. Of course!! 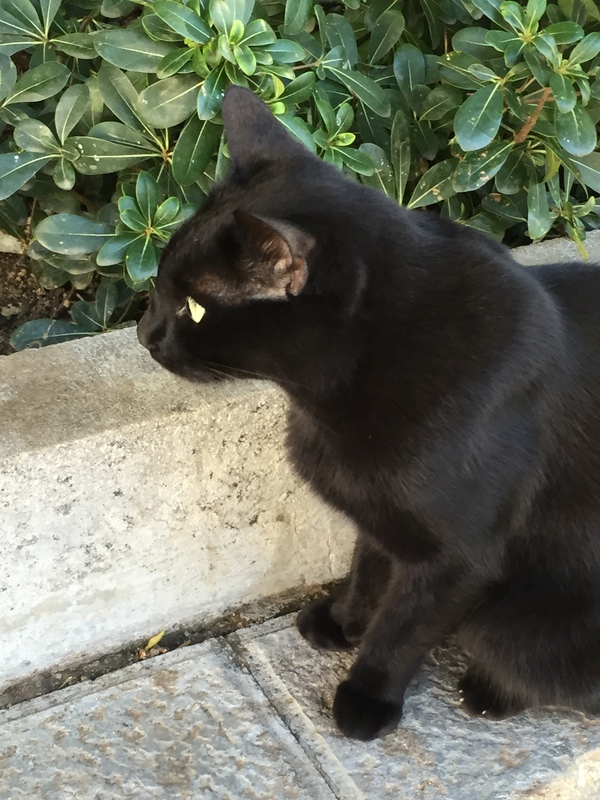 And then yesterday near my favorite grocery store I found one of the black cats that was a kitten last year. It is nice to be home for the winter months. I am planning to explore more this winter than I did last year and have been identifying places that I will venture to from my home base in Mijas. As I conduct my explorations, I will post about them here in my blog. As always, if there are things you would like me to write about in my explorations, just email me or, like Peter and Linda, plan a trip to come visit! There is a lot to see and do. Author barryadayPosted on November 8, 2015 November 8, 2015 Categories Barry DayTags austria, Costa del Sol, España, Fuengirola, Mijas, Mijas Pueblo, Spain2 Comments on Return to Mijas Pueblo, España! In the waning days here in the pueblo it dawned on me that I think of this as my town. I know the town doctor and the people at the Bella Vista know what I like to eat for breakfast. Alfredo, the butcher at the market knows me and shakes my hand as we meet on the street and asks me how I am. Brenda and Steve at The English Tea Room are always friendly and enjoyable to talk with. Of course, Joanne, David and Martin who rent the place I am staying, are very helpful. I even have a taxi driver and butane delivery contact in my phone! As the sun shown on the buildings, I reflected on the initial time I saw the pueblo and how lovely it is. The numerous orange trees still have oranges on them and the air wafts with the aroma of street vendors roasting nuts. Today I had my traditional pitufa con tomate breakfast as I gazed at the valley, the massive Mediterranean Sea, Fuengirola, and the beach below. On my return to my apartment I stopped for bread just out of the oven. Like a local, I knew when it was ready and had my plastic bag ready to carry my items away, just like the local people do. In the final few days here in Mijas Pueblo I feel like I have become a local resident. 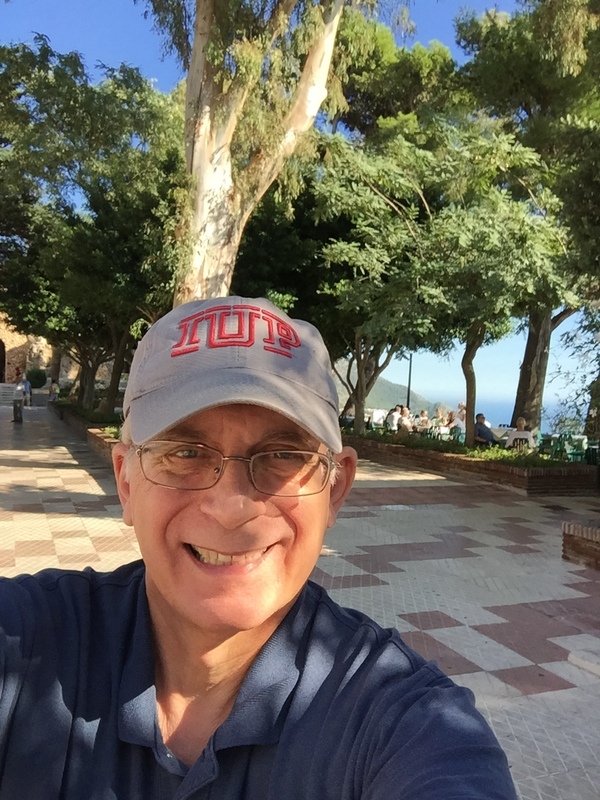 As I move to Krems, Austria in a couple of weeks I am certain to further reflect on my adventure in Mijas Pueblo on the Costa del Sol, the warm beach,, the mountains in Morocco that can be seen on a clear day, the beautiful sunsets, no snow, and many other things. It has been a wonderful place to stay. Malaga is the nearest community to Mijas Pueblo with a substantial population on the Costa del Sol in Andalusia, Spain. It is the capital of the Provence of Malaga. The city is one of the oldest in the world with a recorded history that dates into the 700’s BC. Phoenicians, Romans, and the Moors were all in Malaga at one time or another. Malaga is a port for several cruise lines and many of the people on those cruises take day trips to Mijas Pueblo where I have been residing since October. The climate in Malaga is mild. My day trip began with a bus ride down the mountain I live on to get to the train station in Fuengirola. Forty five minutes later I arrived in the heart of the small city of half million inhabitants. Walking the streets of Malaga there is no doubt you are in a European city. The architecture is beautiful and the avenues are graced with old as well as newer sculptures and fountains. There are outdoor cafés everywhere and it seemed to me that if there was room for a small table, that was sufficient reason to have a place to drink some of the best coffee in the world or to stop for ice cream or chocolate. Malaga is the birthplace of Picasso. I must admit that I find the curiosity surrounding him much more interesting than his art. That is just my taste. But Picasso is found everywhere including one of the Picasso museums that are in the area. Some recommend that Malaga should be a destination for those wishing to avoid snow and winter. Although it is a nice city, my preference is to claim my spot on the side of the mountain overlooking the Mediterranean Sea and the distant Atlas Mountains in Morocco. Next week I plan to visit Mallorca, a Spanish island in the Mediterranean. I hope you will stop by my blog for one of my final entries before I move on to Austria on April 1. For those who have asked, my hernia surgery took place three weeks ago and I am healing fine. It has taken a bit longer than I had anticipated but all is going well.